Surely you mean Noah's Ark..? Nope, Rahab's Ark is the title and that's what we mean! One idea if you have space is to do some kind of representation of an 'ark' in the room. For example, you could mark out the floor with masking tape in the shape of the frame of an ark. When everyone comes into the room, they have to sit inside of the boundaries of the ark. You may well be more creative than this - we're describing an easy way, you may have a more complex way!! 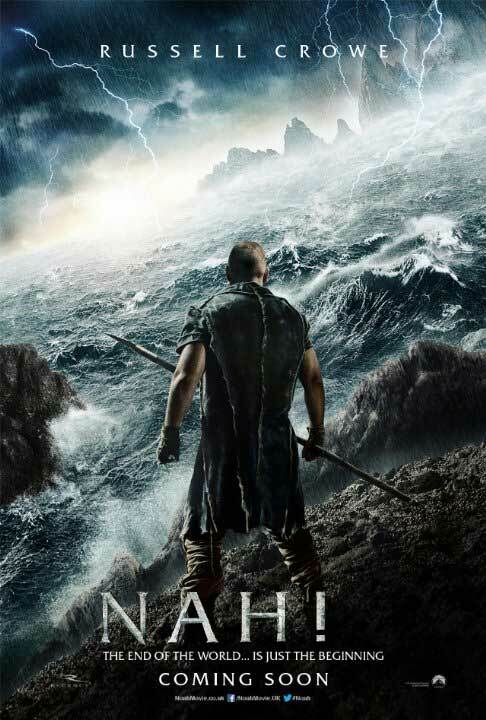 Click on the promo flyer to see how we replaced the word 'Noah' with the word 'Nah!" for a laugh, when suggesting whether people should watch the movie. In reality, we think there’s a balance of good and bad in the movie. One thing it does show accurately is the actual ark. The Ark dimensions given by God were exactly the right shape and dimensions that are copied today by boat builders to make the most secure kinds of boats. God knew what he was doing!! In the Ark, everyone was safe. Outside of the Ark, people weren't safe. Was God doing evil by killing all the people? No! For years, Noah had spoken to the people telling them to stop doing wrong and to turn back to God. But instead they were totally evil in thought and deed all the time! If you've got space, play the game where you have two 'ends' of the room marked with a white line or some kind of clear marking. You have 'runners' and 'catchers' in the game. The runners all start behind the same white line at one end of the room and have to run to the other end of the room without being touched by one of the catchers. The catchers stay in the middle of the room and have to touch the runners. If a runner is touched, they become another 'catcher'. What happens is that gradually more and more people become catchers. The last runner is the winner. You'll need to monitor things closely to keep everyone safe and keep everyone honest in whether they were touched or not !! Let's go back and read some other verses in the Old Testament In Genesis 6.17-18 we read some of the story of Noah and about why he built the ark. If any of them go outside your house into the street, their blood will be on their own heads; we will not be responsible. So in the case of Noah, God told him that he would be safe inside the Ark. We know that this is a picture of Jesus - only those who are 'in Christ' (says yes to Jesus) will be safe and will live life in eternity - just as only Noah and those in the Ark 'crossed over' into a new world. In the same way, Rahab was told that only those who were in her house (herself and family) would be saved from the destruction that would come on her city, Jericho because of their evil. Something people don't like to talk about is God's judgement. But if you were to commit a crime, you would expect there to be a punishment or a consequence. If God is just and good and holy, this doesn't mean he's like a fluffy Easter bunny. It means that he will see that justice is done. Where there is sin there is a consequence without someone coming along to pay the price. In the Bible we see that only Jesus paid the price so only Jesus can make things right with God. Therefore if you don't know Jesus you can't be made right with God, God still sees your sin and one day sin will be punished. Genesis 7.23 - Every living thing on the face of the earth was wiped out; people and animals and the creatures that move along the ground and the birds were wiped from the earth. Only Noah was left, and those with him in the ark. They devoted the city to the Lord and destroyed with the sword every living thing in it – men and women, young and old, cattle, sheep and donkeys. Joshua said to the two men who had spied out the land, ‘Go into the prostitute’s house and bring her out and all who belong to her, in accordance with your oath to her.’ So the young men who had done the spying went in and brought out Rahab, her father and mother, her brothers and sisters and all who belonged to her. They brought out her entire family and put them in a place outside the camp of Israel. Then they burned the whole city and everything in it, but they put the silver and gold and the articles of bronze and iron into the treasury of the Lord’s house. But Joshua spared Rahab the prostitute, with her family and all who belonged to her, because she hid the men Joshua had sent as spies to Jericho – and she lives among the Israelites to this day. Again, we find that those who were not in the Ark (or in Rahab's house) were destroyed. The lesson for us is that those who don't know Jesus will be destroyed - people debate what this means exactly - but it does mean a place called hell. But those inside the Ark and inside Rahab's house escaped all of God's judgement because they were covered. They were inside the boundaries that God had made for their own protection. The thing about God is that he doesn't make us do anything - he draws us to him and wants to help us be made right. But we have the choice whether to say yes or no. Jericho was a city that man had built and the walls fell down. This is a lesson to us that there is nothing that we can do to make things right with God. No human effort will do. We only get made right to God and restored through Jesus. In Joshua 2 and the story of Rahab, we see one other thing. It's a very small thing but it's amazingly important. It's also a lesson to do the smallest thing that God asks us to - even if it seems pointless. If God tells us to do something, we should do it! Joshua 2.18 and 2.21 - "...when we enter the land, you have tied this scarlet cord in the window through which you let us down... So she sent them away, and they departed. And she tied the scarlet cord in the window." Exodus 12.7 and 12.23 - "Then they are to take some of the blood and put it on the sides and tops of the door-frames of the houses where they eat the lambs... When the Lord goes through the land to strike down the Egyptians, he will see the blood on the top and sides of the door-frame and will pass over that doorway, and he will not permit the destroyer to enter your houses and strike you down." So Rahab was also spared because of the scarlet cord in her window. Scarlet is a type of red colour. The Israelites in Egypt escaped the angel of death when they had blood on their door frames. Do you see how these are similar? Again these are representations of Jesus. We know from Hebrews 10.4 that the blood of animals can't make us right with God (nor can having a scarlet cord in our window!!) But we also know from Hebrews 9.22 that we cannot be forgiven (made right with God) without blood being shed. So what God did is sent Jesus and because he was perfect, he was legally able to pay the price for our sin and wrongs and make a way back to God. But we have to accept his sacrifice and believe in Jesus. Romans 3.25 says, "God presented Christ as a sacrifice of atonement (being made right with God), through the shedding of his blood – to be received by faith." Romans 5.9 says, " Since we have now been justified by his blood, how much more shall we be saved from God’s wrath through him"
Ephesians 2.13 says, "But now in Christ Jesus you who once were far away have been brought near by the blood of Christ." These verses show us that the way to be made right with God is through the blood of Jesus. So how can we respond today? 1. We can say yes to Jesus and ask him into our life. 2. We can say sorry to Jesus if we have done things wrong that we know about. 3. Or we can tell him that we're thankful for what he's done and maybe tell him we want to really do amazing things for him.